Coles is the latest retailer to be added to the ever growing list of retailers to choose a e-voucher from. E-Vouchers are a very convenient way to be rewarded as they are send directly to your email, rather than posted to you. Many Australian Survey Sites even often instant delivery of E-Vouchers. 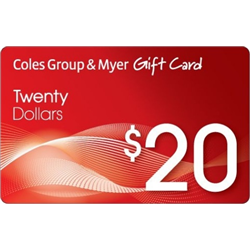 Rewards Central and My Opinions both offer instant delivery of E-Vouchers, you will need to earn 2200 points for a $20 Coles Voucher. The best thing about Rewards Central and My Opinions is you can transfer points from My Opinions to Rewards Central making it easier and quicker to be rewarded. Make sure you join both sites. « Get Paid For Playing Video Games!